A Woman Has Given Birth After a Uterus Transplant for the First Time in the U.S. The uterus transplanted was donated by Taylor Siler, 36, a registered nurse in the Dallas area. In a first for the United States, a woman with a transplanted uterus has given birth. The baby was born at Baylor University Medical Center at Dallas and remains safe and healthy after the event. This is the first success for Baylor’s ongoing uterus transplant clinical trial, which works with patients with absolute uterine factor infertility — meaning their uterus either doesn’t exist or doesn’t work at all. The uterus transplanted was donated by Taylor Siler, 36, a registered nurse in the Dallas area. She previously had children successfully and wanted to pass the gift of life on. “I just think that if we can give more people that option, that’s an awesome thing,” Syler told Time. 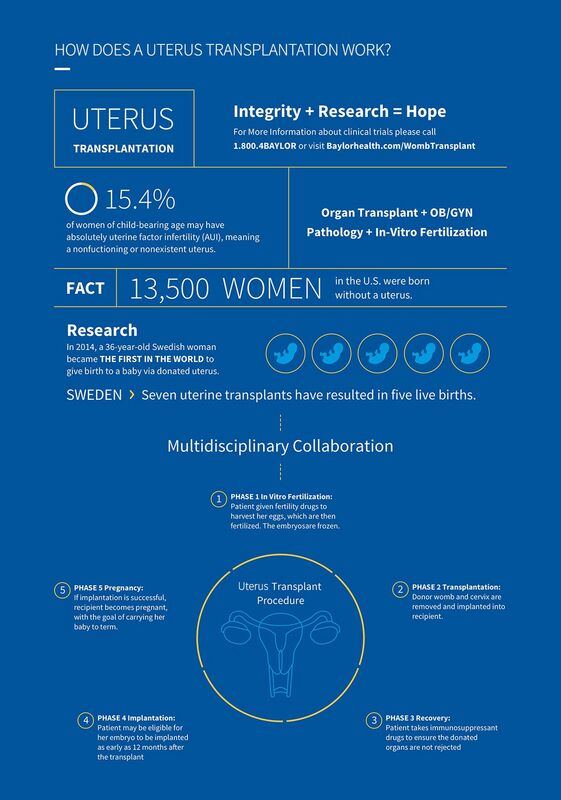 It takes about five hours to remove the uterus from the donor, then another five to transplant it. The clinical study uses uteruses from both living and deceased donors. So far, the hospital has completed eight out its goal of 10 transplants. And, while three have so far failed, Baylor confirmed to Time that there is another woman currently pregnant with a transplanted uterus. This medical feat has had a long road to success. Last year, at the Cleveland Clinic, a promising uterus transplant went awry, and the organ had to be removed. This failure was devastating, but it perhaps aided further research and fueled this year’s exciting success. The majority of the patients participating in this study have a condition known as Mayer-Rokitansky-Küster-Hauser syndrome and have lived their entire lives thinking that it was simply impossible for them to carry a child. But this type of procedure could improve the lives of patients with a multitude of conditions. It opens the door for helping those who have had hysterectomies, couples struggling with infertility, and those born without uteruses like those with Mayer-Rokitansky-Küster-Hauser syndrome and transgender patients. As we see advancements in womb transplant, we are also witnessing growth in the field of external wombs. Whether they are used in cases of infertility or truly represent the future of reproduction, external development of a fetus has so far proven successful in lambs. As our understanding of human reproduction continues to expand, artificial wombs could potentially become a more viable option for humans. Currently, the uterus transplant procedure is very expensive — up to $500,000. The procedure is also seen by insurance companies as elective and, therefore, is not covered. The success of the procedure and the emerging field is still new, though. It’s certainly not out of the question to think that in the coming decades, procedures like this will be more commonplace — and therefore, hopefully, more affordable. We still need to do a lot more research and experimentation before this type of procedure becomes more widely available — let alone routine. But this latest success proves that it’s not just possible, but life-changing for the patients who experience it.